The inspiration from this came from the TV-series Hannibal. Yup, that series. About the cannibal. There's some lovely cooking and plating displayed through both series so far, I hope this continues in season three as well. This specific dish was mentioned in episode six of series two - Futamono - where it is served during a dinner party. I actually served this when a couple of friends were over for dinner so I guess that counts as a smaller dinner party. One guest was a bit doubtful as to if she should turn up or not when I mentioned on Twitter that one of the courses would be influenced by Hannibal. As you can see from the picture I need more practice in the art of making the prosciutto look like roses but that's something I'm happy to do. As long as I get to eat the end product. 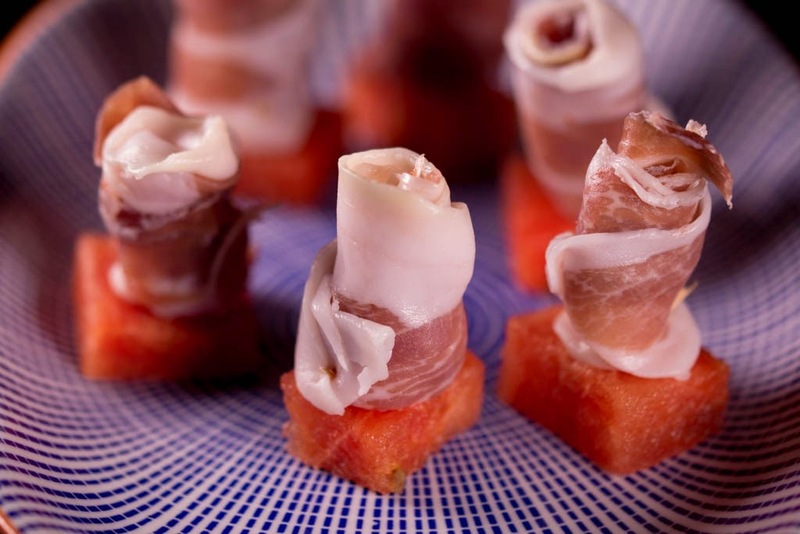 Take a slice of prosciutto and twist it into a long strand. Tightly wrap it into a rosette, trying to make it look like a rose. Position the 'rose' on a piece of watermelon and secure it with a cut to size cocktail stick or similar. Repeat until all prosciutto is used up.